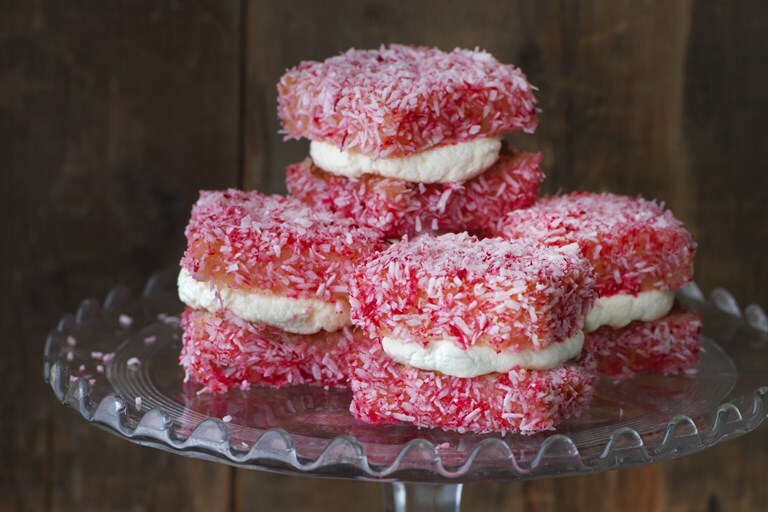 Claire Clark shares her recipe for Lamingtons, a classic Australian sweet treat. Little squares of soft sponge cake are rolled in icing and desiccated coconut, then filled with the delicious combination of whipped cream and raspberry jam. Pretty as a picture, these pink cakes originate from Australia. There is some controversy about their origins. Some say they were named after Baron Lamington, the Governor of Queensland from 1895 to 1901. Others think that Lady Lamington, patron of a famous cooking school in Brisbane, was so admired that the cookery teacher, Amy Shauer, named them after her. I like this version of events, as Baron Lamington didn’t even like cake and was apparently a rather grumpy man. Traditionally the cakes are chocolate and coconut, filled with a layer of plum jam, but I love this pink version and they can be adapted to several flavours. I have used raspberry jam here but strawberry, redcurrant and, of course, plum all work a treat. For extra texture, these are filled with fresh cream too. This recipe is from Claire Clark’s book 80 Cakes From Around the World(Absolute Press, £20).